Quick Breakdown: An arcade style game where you play as a triangle trying to survive deadly lines while pulsating electronic music plays. It’s like having a seizure while tripping balls on heavy psychedelic drugs. 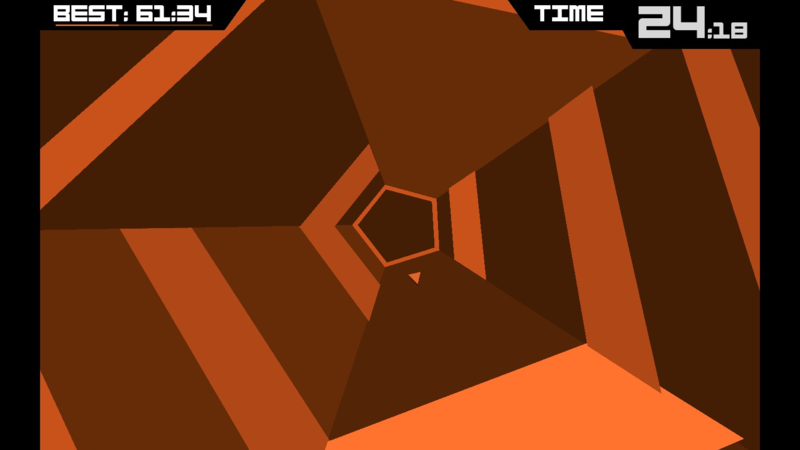 Full Review: Super Hexagon is a pretty straightforward game. Admittedly, when I first saw screenshots for the game, and even the first time I watched a video on it, I had no idea what the hell was going on. This was a combination of the trippy visuals, and how graphically simplistic it is. 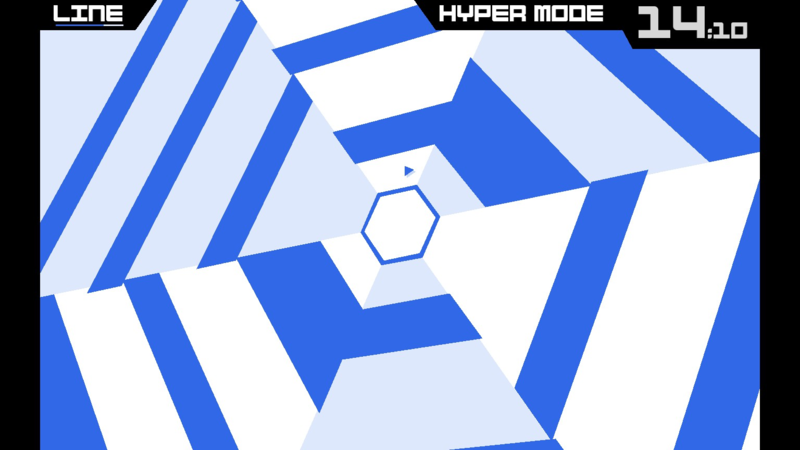 The game has six levels: three you begin with and three that are hard modes unlocked by completing the corresponding basic level. To “complete” a level you must survive for 60 seconds. I put complete in quotes there, because levels last until you die with no set end point. However, the game rewards you with an achievement for lasting 60 seconds and considers it as beating the level. Levels are comprised of different patterns of lines that you must dodge. For each ten seconds that you survive, you unlock an additional set of patterns (up to the first 60 seconds). On some levels the center hexagon even morphs into a pentagon or a square to shake things up a bit. Other than that, there’s not a lot to the gameplay. The music in the game consists of 3 different electronic songs, and they fit the game pretty well, matching the trippy visuals and rapidly changing colours. I just wish there were more than 3 tracks in the game; while they’re good, it’d be nice to have a little more variety. The gameplay itself is pretty damn difficult, much more than one might expect from such a simple game. As such, I’ve not been able to beat the game, and I’ve so far only managed to last the full minute on the first two levels. I’m not sure that I’ll be able to complete any other levels, though I’ll probably play it a bit more here and there. Chances are that even if you can’t beat the game (quite likely), you’ll be able to get at least 3 hours of entertainment out of it before you move on to another game. Given that the game is only $3 on Steam normally, and sometimes goes on sale for $1, I think that’s a reasonable price to pay for what you get. 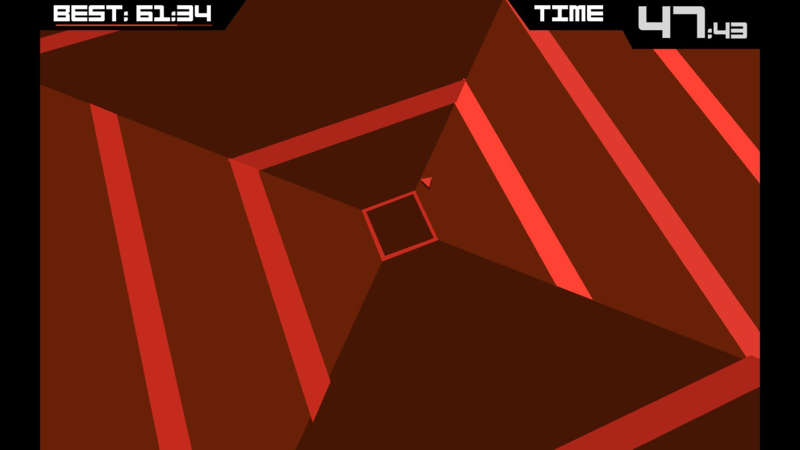 Super Hexagon isn’t a must-have game, but it’s a fun little time killer. Chances are you won’t beat it, but it’s more of an arcade game where you see how long you can last anyway. Give it a chance if that’s your sort of thing.